WHEN the New York Knicks visited Cleveland last Friday night, they encountered little resistance from an overwhelmed and undermanned Cavaliers team that lost badly, 120-103. But Sunday afternoon's road trip to Boston told a starkly different story. The Celtics, the 2008 NBA champs, weren't as welcoming at the TD Garden with their suffocating defense and multiple offensive weapons in full display. The Knicks, who struggled from the get-go and trailed 21-12 in the opening quarter, somehow made the duel an entertaining, high-scoring battle. But in the end, there was too much Paul Pierce. And way too much Rajon Rondo. Pierce drilled 34 points, including a clutch 3-pointer that knotted the count at 103 and forced the game into overtime when the Knicks failed to convert in the final 4.9 seconds of regulation. The Celtics then took full advantage of their new lease on life and dominated the overtime period to score the 115-111 win. And while Pierce had his fingerprints all over this match-up, the game clearly belonged to Rajon Rondo, who easily outplayed Knicks point guard and current NBA sensation Jeremy Lin. Rondo, the subject of trade rumors all week, waltzed his way to 18 points, 20 assists and 17 rebounds. If the Celtics want to contend for an NBA title for years to come, they might want to keep Rondo, a 3-time All-Star who is only 26 years young and already a 5-year NBA veteran. 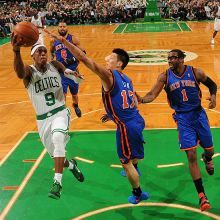 As Rondo soared, Linsanity was curbed. Lin got into early trouble, picking up two quick fouls in the first three minutes of the contest. He did log 31 minutes and 50 seconds of play, but he was out of sync, making more turnovers (6) than assists (5) and clunking 10 of 16 shots. Lin found some traction late in the fourth quarter when he scored six consecutive points to put the Knicks to within 95-96. New York eventually seized the lead and took what seemed like a comfortable 103-100 bulge following a pair of Steve Novak free throws. But Pierce ruined the comeback with his dagger 3. Carmelo Anthony had 25 points while Amare Stoudemire added 16 points and 13 rebounds, but the Knicks couldn't overcome 22 turnovers and poor shooting -- a meek 41 of 94 from the field for a poor accuracy rate of 43.6 percent. Boston converted just 45 of 103 shots (43.7 percent) but they huge contributions from All-Stars Kevin Garnett and Ray Allen. KG swished for 18 points and grabbed 10 rebounds while Allen chipped in 14, including a big 3 in overtime that fueled the Celtics momentum. Boston improved to 19-17 in the standings while New York fell to 18-19.